A collection of model cars that were owned by the founder of a toy firm has sold for more than £21,000. Many of the models were "straight from the factory floor" and "proved a big draw for collectors far and wide", the Vectis spokeswoman said. 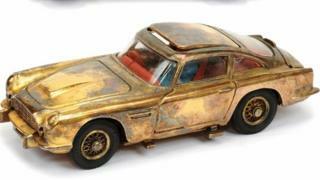 Despite the failure to sell the gold-plated Aston Martin, the whole collection still exceeded its upper estimate of £20,000. Mettoy was founded in the 1930s by German Mr Ullman and had factories in Northampton and Swansea. In the 1950s it started its Corgi line of die-cast metal vehicles. Harry Potter auction: How much are signed books worth?